Have you been feeling deserted? I've been trying to decide why I have been hesitant to get back to posting regularly. Probably the main thing is that deep down I don't like the pictures I've been taking. Some of them I don't like because the project or location of the project is just difficult to photograph. I try to hide the fact that I'm a perfectionist. Normally I am easier on myself and try not to let myself get stymied by lack of perfection. I mean, have I EVER done ANYTHING perfectly? I'm forcing myself to post all of my imperfection. Bit by bit . . . I bought a wooden cutting board. I sanded it all over and cleaned it and put hemp oil on it and used for 2 years. It was one of those cutting boards that wood crafters make out of different kinds of wood and sell at shows. Between each two pieces of wood there was thin strip of wood that separated each section. The first time it started coming apart I glued it back together. But it came apart again. Probably because I just used regular wood glue and I guess you need to use a product that is more water resistant. Instead, the second time I glued it together I decided to use it for something decorative. So it would never have to see water again. I had been wanting to make one of those cutting board recipe/tablet holders that you can find a million times over on google or Pinterest. 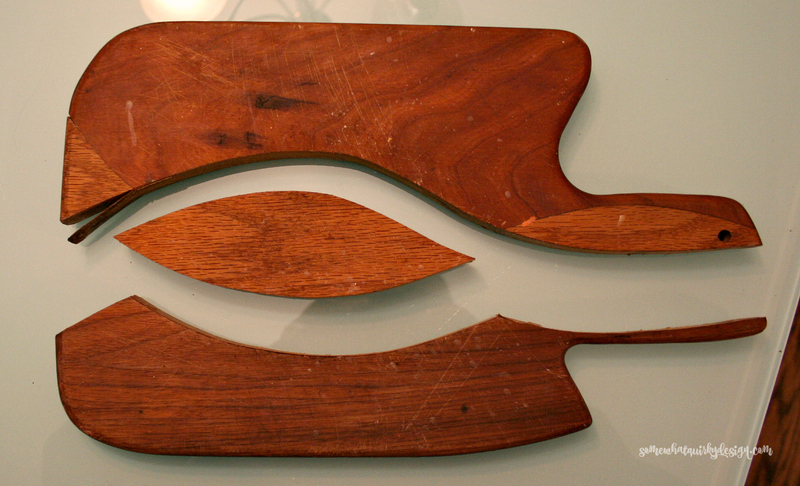 And actually, I bought a couple of other cutting boards at the same sale. They are really just shaped like cutting boards - made out of some kind of cheap board that would work only for crafting. I'll probably do something with those eventually. But not this time. Find your trim and glue it on. Some people use upside down quarter-round for this. Glue flat side of the quarter-round to the cutting board with the other flat side towards the top of the cutting board. Your recipe or tablet just sits on the flat of the quarter-round. I wanted to use some scraps I had from an old dresser I painted. I think these pieces were used to hold up a mirror that I removed from the dresser. 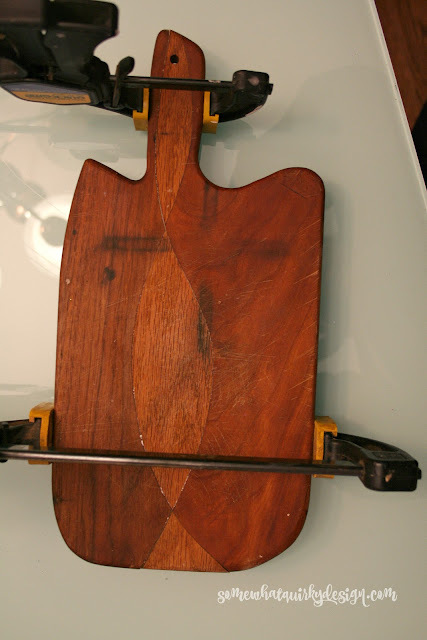 Because this piece was flat I had to add a small strip of wood underneath it to hold it out from the cutting board and create the holder on the board. Hopefully you can see what I mean in the picture. You can also see that I didn't bother to stain the wood that I used for the spacer. I like those screw holes in the board. Cut your dowel to approximately 5 inches long. Drill a hole in your cutting board the same size as the dowel. The wood on my cutting board was REALLY HARD and difficult to drill. 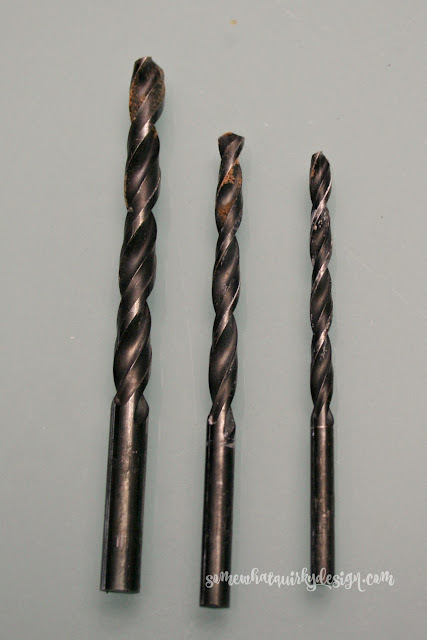 I used a succession of drill bits to make drilling the hole a LOT easier. Note: I erroneously thought the hole needed to be at an angle for this step.It did not. 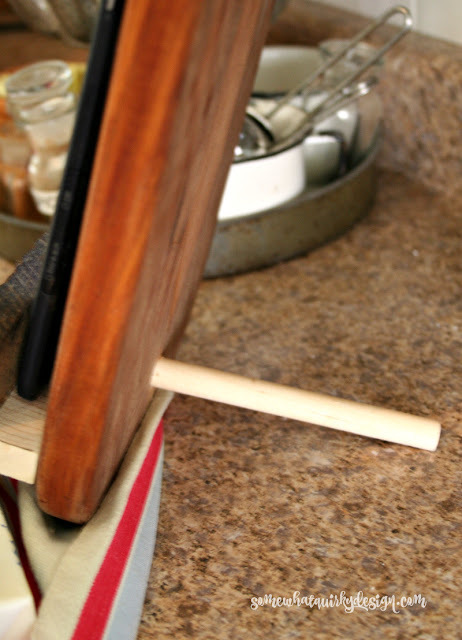 Drill the hole straight into the cutting board. 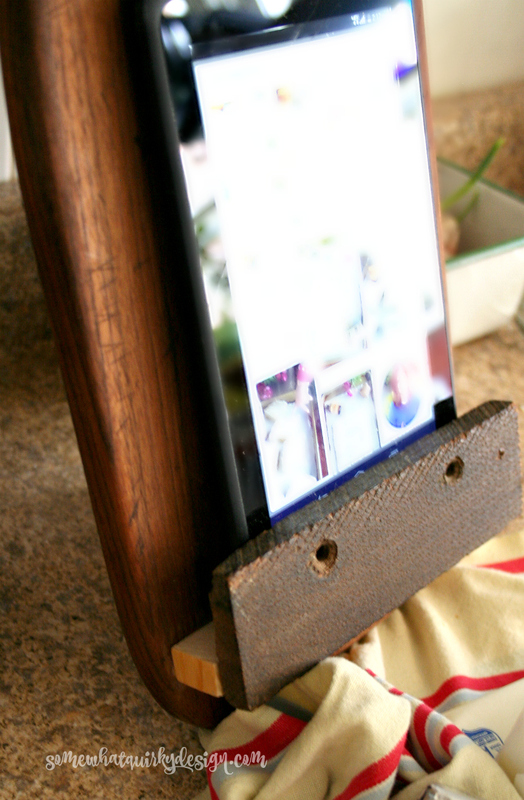 When you are using the tablet holder just stick the dowel into the board and it will stand up. 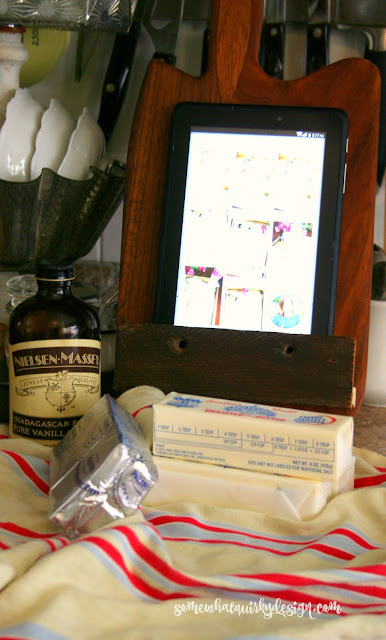 I like my little cutting board recipe/tablet holder with bad pictures. And it's nice to have around. If you want to go for perfection, have at it. But don't let imperfection hold you back. I saw a quote the other day that states that "Done is better than Perfect". It's going to be my mantra from now on, lol! That's a nice project and would make a thoughtful gift. Nothing wrong with that thang.